Yesterday was a beautiful, sunny and warm day. 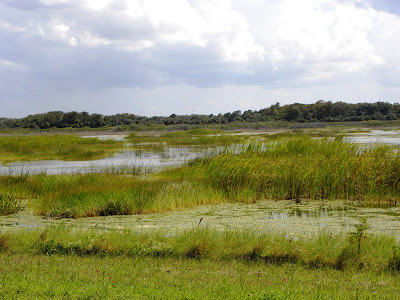 When Bill returned from the RC flying field we decided to walk at Harns Marsh in Lehigh Acres. 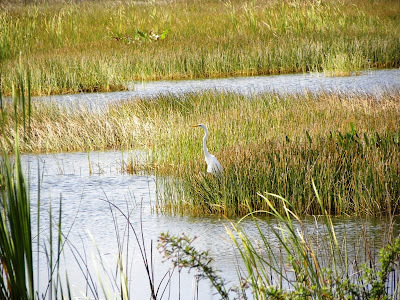 The marsh is a 578 acre preserve that is part of the East County Water Control District and one of the area’s major stormwater retention facilities. 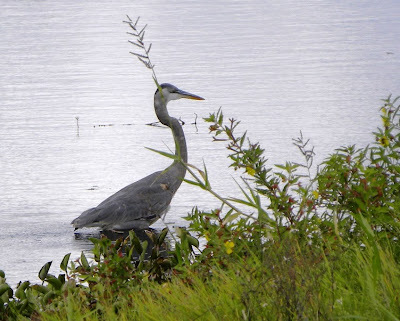 Last year, we went in March (see my blog entry for March 27) and there were hundreds of wading birds, ducks, coots and shore birds - all in full mating plumage. The spring flowers added bright colors to the green grasses and blues of the water and the sky. Yesterday, we had a great walk, saw a few birds and it was still wonderful. 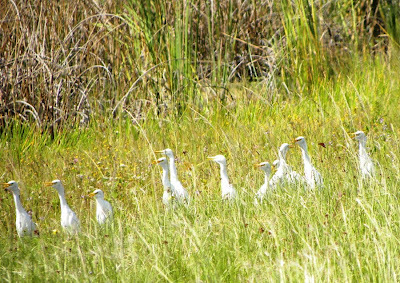 There was a large flock of Cattle Egret that kept landing in front of us. As we approached, the group flew as one and landed just a little further up the path. 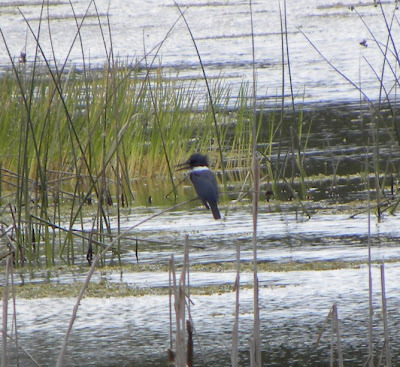 We heard the machine-gun-like call of this Belted Kingfisher before we spotted him perched by the water looking for a fish lunch. We call this the WalMart bird because they gather in the trees in every WalMart parking lot. 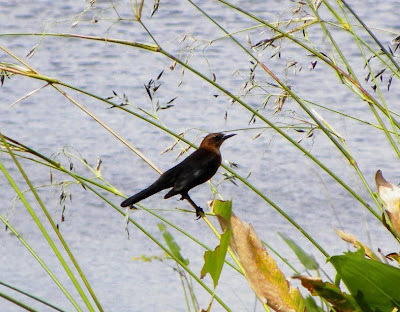 It is actually a Brown-headed Cowbird - noisy, nasty birds. There were several Great Egrets - large, beautiful birds. 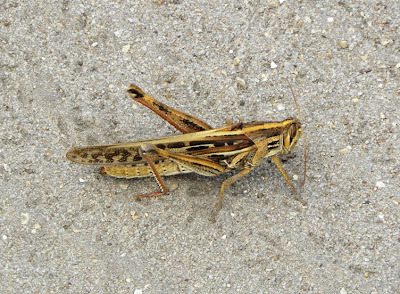 This grasshopper was walking around in circles in the sand. If you click on the picture to see a larger version - you can see the tracks. He had created a large, interesting pattern while looking for smaller insects. This is a Snail Kite - rare birds found only in a small area of central Florida. They eat the large apple snails that are abundant in the swamp. 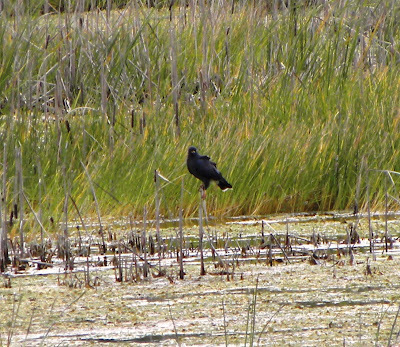 I'm not very happy with the pictures I took on this trip to Harns Marsh - I need to remember my tripod so when I zoom all the way in, I can keep the camera steady. 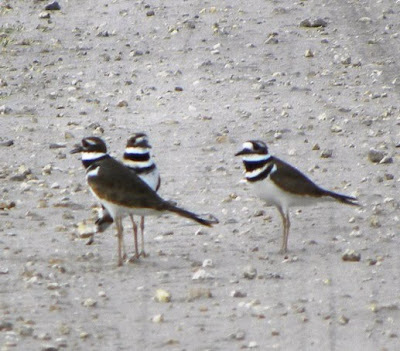 We were joined on our return walk by these lively - and noisy - Killdeer. 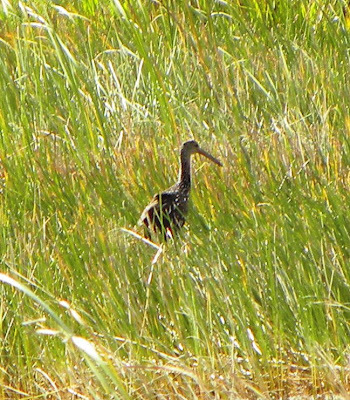 Another uncommon bird found mainly in Florida (rarely seen further north than southern Georgia) - a Limpkin. He is probably shopping for frogs and snails. 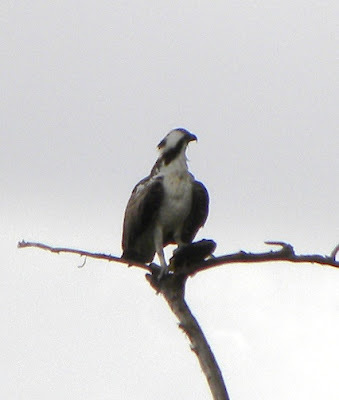 As we were leaving, this Osprey flew over to a tall tree on the other side of the lake with a fish in his talons. He looks proud of his catch.